April 22, 2018 — Three years ago this morning, I was having breakfast with our daughter Lindsay in Charleston, W.Va., reflecting upon the Preserving Sacred Appalachia conference we had organized with the help of countless of others. It has broken up the day before, and we allowed ourselves an extra night int he Mountain State’s capital to visit our favorite restaurant for dinner — Leonora’s Spagetti House. We were hopeful. Despite a steady, cold rain that morning, the outlook we took from the conference reflected that spring morning; while it was cold and rainy, the grays and browns of the West Virginia winter had finally turned green in the Kanawha Valley. Indeed, during the warm and sunny days of the conference, the 50 or so gathered often looked longingly out the window at the budding leaves gently moving from the invisible breeze. But we stayed inside, because we were gathered for a common and critical purpose — preserving Appalachia and all of the planet. We presumed, as you will read below from the article posted shortly after the gathering, that people from all backgrounds and disciplines could and would agree that the earth is sacred because it is the source of life. We did. However, three years later, it is clear that the fossil fuel industry has been crushing all efforts at preserving our air, land and water. EQT (Pittsburgh), Dominion (Richmond), and Duke Energy (Charlotte) have set up a nice little triangle of fossil fuel dominance in Appalachia. Since 2010, they have bought the legislators in North Carolina, Pennsylvania, Virginia and West Virginia. Federal and state regulatory agencies have ignored the law and will of the people and greased the tracks for the very companies they are supposed to hold in check. CHARLESTON, W.Va. – Approximately 40 ecological preservationists joined together in Charleston at the St. John’s XXIII Pastoral Center from April 19-21 to champion responsible environmental stewardship in the context of understanding that Appalachia – and all the earth – is sacred. Among those at the “Preserving Sacred Appalachia” conference were people of faith, activists, artists, scientists, politicians, and educators. 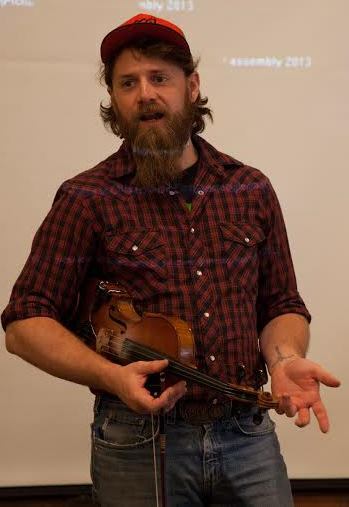 Ben Townsend, a West Virginia native and traditional Appalachian musician, teaches at the conference. 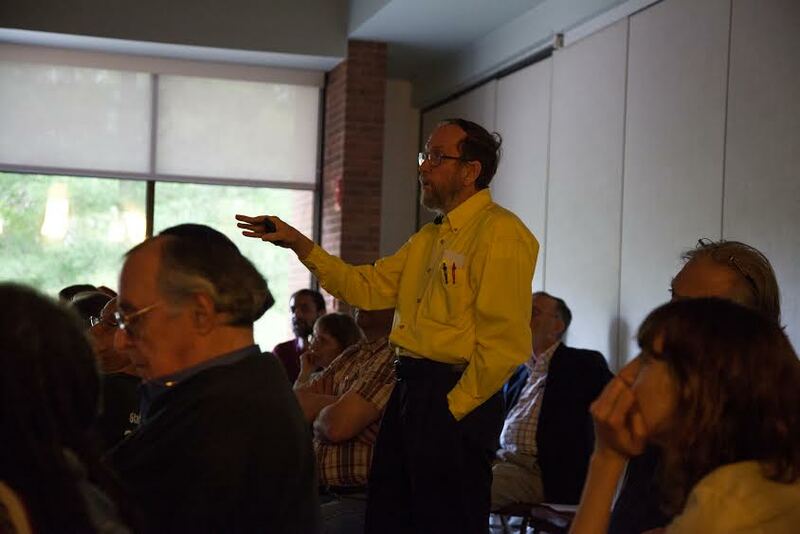 The unprecedented interfaith and interdisciplinary gathering was sponsored by St. Luke’s United Methodist Church of Hickory, N.C. In-state partners included the Sierra Club – West Virginia chapter and West Virginia Interfaith Power & Light (WVIPL). The Appalachian Preservation Project handled public relations, planning and logistics for the conference. 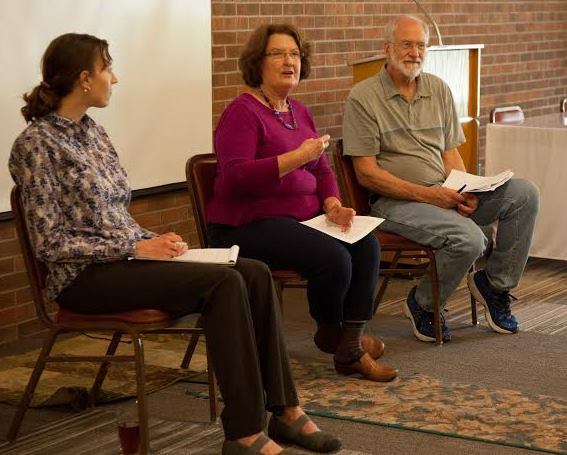 It was an intentional interdisciplinary and interfaith outreach by and to people that are devoted to preserving the eco-systems which support life in Appalachia. It brought together the region’s rich collection of seasoned, experienced preservationists. While several organizations provided speakers, the event also included numerous attendees from West Virginia and other Appalachian states determined to identify fundamental areas of agreement regarding the immediate core challenges to Appalachia’s eco-systems and key strategies for addressing them. 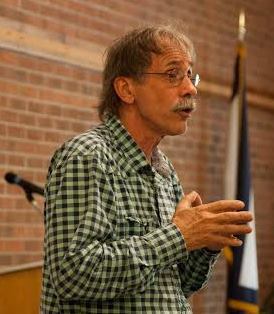 Bob Henry Baber, an Appalachian poet, writer and educator, speaks at the conference. The gathering concluded with a roundtable discussion of the topics discussed over the course of the conference. From those discussions, participants will issue a white paper – scheduled for release this summer. The white paper will be a unified, decisive statement identifying the core challenges threatening the people and environment of Appalachia; explaining what makes Appalachia – and all the earth – sacred; and to equip the people of Appalachia with practical, effective methods to help preserve the region’s water, air, soil, habitats and natural beauty. 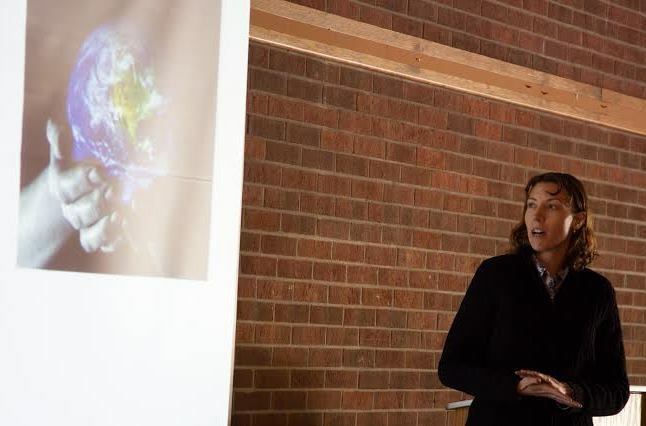 The keynote speaker was Tierra Curry, the senior scientist and a conservation biologist at the Center for Biological Diversity. The conference kicked off with an extended trailer of the feature film, “In the Hills and Hollows,” a documentary by Keely Kernan, an award winning freelance photographer and videographer. The documentary, which Kernan is presently filming, investigates the boom and bust impacts that mono-economies based on fossil fuel extraction have on people and their local communities. Tierra Curry with the Center for Biological Diversity discusses the impact of climate change upon Appalachia. Other speakers included Susan Hedge with the Catholic Committee of Appalachia; Bill Price, the organizing representative for the Sierra Club – West Virginia Chapter; Allen Johnson of Christians For The Mountains; Angie Rosser, the executive director of the West Virginia Rivers Coalition; Ben Townsend, a West Virginia traditional musician; Carey Jo Grace and Tuesday Taylor with Our Children, Our Future; Robin Blakeman, the Special Event and Membership Committee Organizer for the Ohio Valley Environmental Coalition; Mike Manypenny, a former member of the West Virginia House of Delegates; Bill Hughes, the West Virginia Community Liaison for the FracTracker Alliance; Bob Henry Baber, a widely published Appalachian poet, novelist, creative writing teacher and mosaic artist; Barbara Ann Volk, a Lewis County landowner; Liz Wiles, the chair of the Sierra Club – West Virginia chapter, as well as Aurora Lights and the Mountain SOL school; Lindsay Barrick, an artist and the Director of Programs at St. Luke’s United Methodist Church; Mel Hoover and Rose Edington with WVIPL; Autumn Bryson, an environmental scientist; Michael Barrick, the founder of the Appalachian Preservation Project and publisher of the Appalachian Chronicle; and, all of the conference attendees. Topics addressed include Appalachia’s sacredness, climate change, water quality, the role of art and music in telling Appalachia’ story, mountaintop removal, fracking, natural gas pipeline development, child health, politics and policy. It also included times of meditation, reflection and sharing. Bill Hughes with FracTracker Alliance teaches about the harms associated with fracking. Tierra Curry (L), Susan Hedge and Allen Johnson lead a discussion on the sacredness of Appalachia. 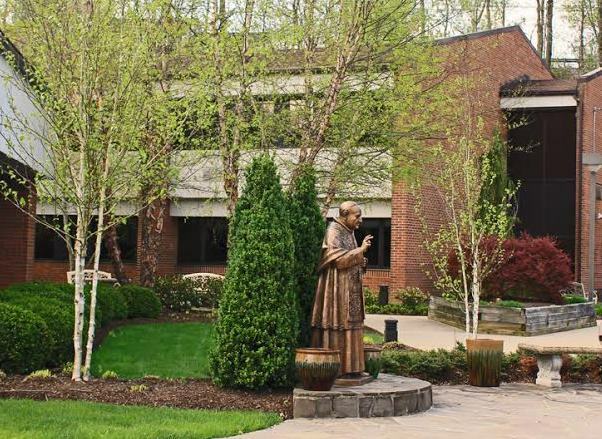 St. John’s XXIII Pastoral Center.